A promising new study published in the International Journal of Food Sciences and Nutrition reveals that the popular kitchen spice ginger may be an effective treatment for the prevention of diabetes and its complications. Ginger is in the same plant family (Zingiberacea) that includes the medicinal powerhouse turmeric , and which only recently was proven to be 100% effective in preventing the development of type 2 diabetes in prediabetics, according to a study published in the American Diabetes Association's own journal Diabetes Care. In the new ginger study, titled "The effect of ginger consumption of glycemic status, lipid profile and some inflammatory markers in patients with type 2 diabetes mellitus ,"[i] 70 type 2 diabetic patients were enrolled in a double-blinded, placebo-controlled clinical trial, the objective of which was to assess the effect of ginger consumption on glycemic status, lipid profile and some common inflammatory markers associated with the condition. 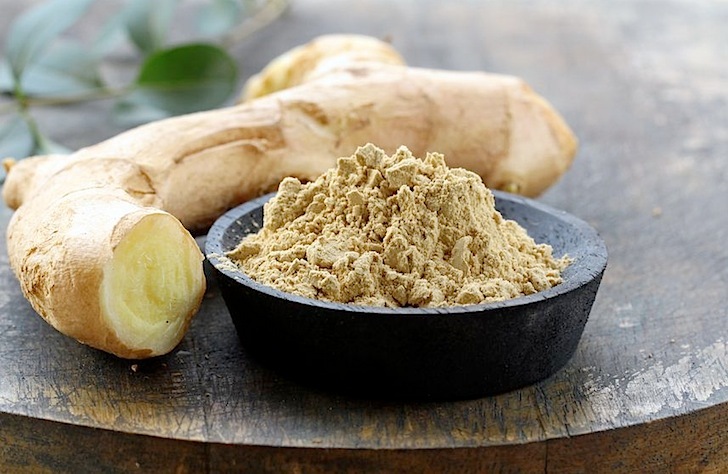 The trial participants were divided randomly into a ginger group and control group, receiving either 1600 mg ginger or a 1600 mg placebo daily for 12 weeks. The patients were measured before and after the intervention for blood sugar levels, blood lipids, C-reactive protein, prostaglandin E2 and tumor necrosis factor alpha (TNFα). No significant differences in HDL, LDL and TNFα between two groups (p > 0.05). "Ginger improved insulin sensitivity and some fractions of lipid profile, and reduced CRP and PGE2 in type 2 diabetic patients. Therefore ginger can be considered as an effective treatment for prevention of diabetes complications." This is, of course, not the first study to establish the value of ginger for diabetes. Simply dropping the two search terms "diabetes" and "ginger" into Pubmed.gov will draw up 63 results . Our database of abstracts on ginger contains a number of gems on its benefit for both type 1 and type 2 diabetes which can be viewed here: Ginger Health Benefits . Additionally, the research on turmeric (and its primarily polyphenol curcumin ) as a diabetes aid is far more plentiful, with 123 results for the search terms "turmeric" and "diabetes ," and 252 for "curcumin" and "diabetes," on the National Library of Medicine's Pubmed.gov database. To view our curated research on turmeric's diabetes benefits (as well as for 600 other disorders ), view our page on the topic: Turmeric Health Benefits . The amount of ginger used in the study amounted to 1.6 grams, which is a non-heroic, 'culinary' dose of approximately a quarter of a teaspoon. In the study, participants were given two doses of 800 mg, delivered twice daily, orally through capsules. This dose scheme points to the fact that higher doses does of complex plant extracts within the spice category are not necessarily better, and in fact, in some cases, may actually have effects opposite to the expectation. This study , for instance, found that rosemary at a lower dose (750 mg) improved cognition whereas a higher dose (6,000 mg) interfered with it. The point is that lower doses, as used traditionally in culinary applications, passed down to us through previous generations as 'recipes' (literally: 'medical prescriptions'), may be more effective than higher ones; a perspective that obviously turns conventional pharmacological wisdom and practice on its head. Learn more here . The GreenMedInfo.com database now contains 350 abstracts on 180 natural substances that have been researched to have potential value in the prevention and treatment of type 2 diabetes, and which can be viewed on our Type 2 Diabetes Research page. The resource also includes Problem Substances (e.g. fructose, BPA), Therapeutic Actions (e.g. yoga, low carb diets) and Problematic Actions (e.g. vaccination, microwave cooking) linked to this condition in the published research. We also have a curated health portal on Blood Sugar Problems (click hyperlink to view) which aggregates both our research sections on type 1 and type 2 diabetes and our reporting on various studies related to these conditions in greater depth. This page contains a single entry by sal published on February 10, 2014 4:12 PM. Sugar: Killing Us Sweetly was the previous entry in this blog. Sheer Ignorance and Insanity Is The Hallmark of Medical Practice Throughout History - Here's The Proof is the next entry in this blog.